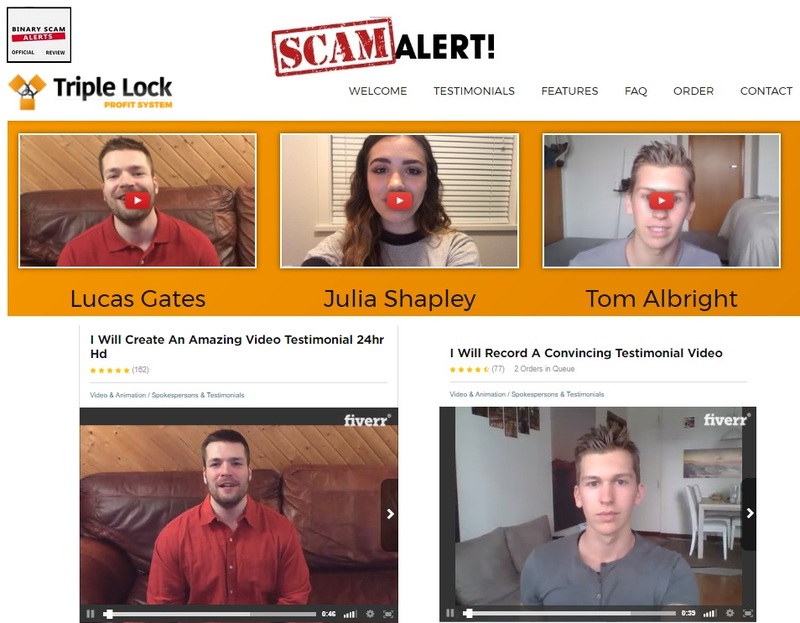 The Triple Lock Profit System, Algo Premium software and trading robot by William Maynard is a cheap scam and that’s why we blacklisted this fraudulent app in our factual and detailed review and investigation. This is what we refer to as an “old school scam“, and that is because the idiotic creators of this software have failed to understand that this type of scheme will no longer be tolerated by the industry-leading review sites. In essence, what we have is the classic hard-sell type of get-rich-quick scheme which includes promises of massive wealth at the click of a mouse. We absolutely abhor these types of videos and sales pages, and frankly we never cease to be amazed how some opportunity seekers always take the bait and fall for this type of deceptive and misleading scheme. If you have stumbled on the the Triple Lock Profit System after receiving a SPAM email, then you should know you have been targeted by unethical affiliate marketers who will sell you snake oil if it lines their pockets with commissions. You can’t afford to get ripped off anymore! So make a note and don’t say we didn’t warn you. This software is NOT legit or genuine, and the people trying to lure you into this web of lies are very patient and persistent marketers. They understand that the more emails they send, the higher their chances of baiting you, so just move the mail to your junk box and report them as spammers to your email provider. Keep reading to see why we got so many complaints and how our staff exposed these crooks in the most transparent and revealing way. Below you will find the main sales page of the Triple Lock Profit System AlgoPremium software. Notice how they use the same hype in order to drag you into their lies. Here’s a picture of “William Maynard” a “hugely successful trader”, and right next to it is an image of a man with a capture above it which says “happy senior man wearing glasses”. It’s quite easy to see the two are one and the same and it’s fair to say that these guys have been caught with their hands in the cookie jar. We hate fake testimonials, and as much as we tried there is not one real person in the sales page who will stand up and say something of substance about this app (and with good reason). This should be enough for you to realize what you have stumbled onto, but if you still have some doubts and want to test the waters then this should totally dissuade you. Here is the testimonial section in the Triple Lock sales page. They are all Fiverr.com actors and they got paid $5 measly dollars to spew lies about how well this software has performed for them. Only 15 people he had never met before, just like you were made into “millionaires”. Maynard needs YOU to test out his software, which will make you a minimum of $5,000 a day! Members of Triple Lock Profits will at minimum secure a monthly income of $300,000. Right now he is looking for Beta Testers to help test his software, and he is willing to pay a total of $10,000 a day (the numbers keep changing, it’s awful). Furthermore, he claims it is free and no money is required to invest. It combines 3 types of income streams to “lock in” your daily profits. If one stream fails, the other incomes act “as a safeguard”. He’s is supposed to be a businessman, philanthropist, and the founder and creator the the Triple Lock Profit System. He’s also the “CEO” of Maynard Financial Software, and now he is about to give you the key to the most profitable automated financial trading software, the AlgoPremium trading software. He started out in Wall Street where George Soros taught him everything he knows. He used his knowledge as a Wall Street Trader where he predicted the sub-prime crisis in order to create the Triple Lock Profit System. He was raised by a single mom on the South side of Chicago along with 4 brothers and sisters. His father was a heavy drinker and left the house when Maynard was a small child. He started working at the age of 7 to help out at home, but he went to night school to learn finance and accounting. That allowed him to go to New York and find a job. Today is a life-changing day for you! No trading experience or special skills are required, just your email address so he can send questionnaires for feedback. In reality this thing wreaks of scam and you are on your way to getting swindled. All the tell signs are there including fake testimonials, hyped-up and exaggerated claims of easy money, inflated bank accounts, and outrageous lies and fabrications. The narrative is also full of holes and inconsistencies, and the numbers just don’t add up. No – get ready to part with at least $250, that money will be charged to your credit card by thieving offshore brokers. Sure, we saw a couple so don’t believe them and make sure to stay alert and completely on your toes because these so called “honest review sites” are getting paid on the back end. The hot ones to avoid are Quantum Code and Forex Cyborg. If you are deliberating and not quite sure about how to proceed then you are not alone. Our staff of researchers has combed the net looking for the best and most consistent money-making apps. The short list can be found in our recommended section. The Triple Lock Profit System and AlgoPremium software by William Maynard is a confirmed financial scam and we naturally blacklisted it in our fair and impartial review. This fake trading robot has nothing to do with automated trading and everything to do with defrauding unsuspecting opportunity-seekers and stealing their hard-earned money. A word of caution, these crooks are well-known in the industry and have a checkered criminal past. This is a savvy fraud network which specializes in credit card fraud and identity theft, so please never divulge any personal or financial information. In light of all the proof and evidence of foul play our staff has produced, we have no choice but to BLACKLIST the Triple Lock Profit System and the AlgoPremium software. We recommend our members and viewers seek alternative and more legit investing avenues. As always, we invite you to join our Facebook Page and YouTube channel and get informed.